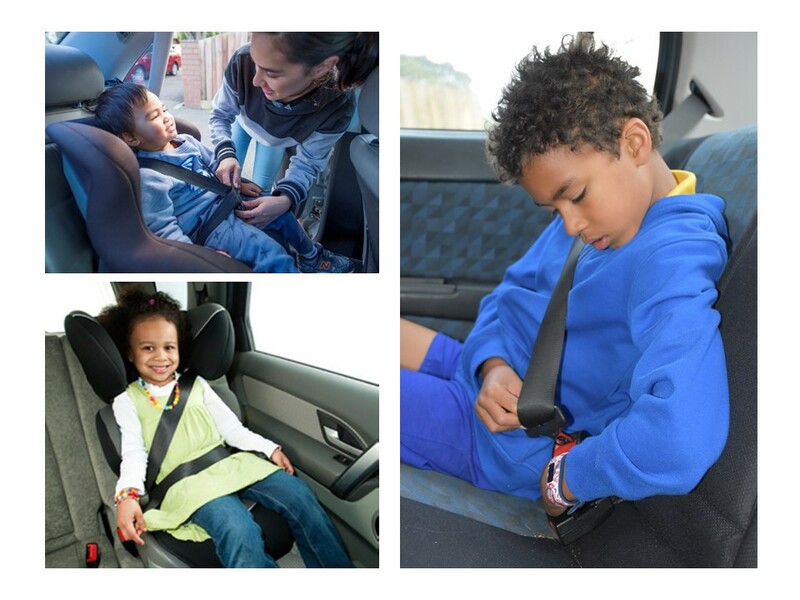 Discuss different types of seat belts and restraints using the pictures below. Set up a small experiment with a toy car and a doll that fits into the car. Get the class to predict what might happen if the car ran into an obstacle with the doll unrestrained. Crash the car into a wall or something solid, noting the effect on the doll. Discuss. Restrain the doll with a ‘seat belt’ (use a rubber band or ribbon) and ask students to predict what might happen this time. Again, crash the car, noting what happens to the doll. Ask the class to draw some conclusions about how restraints protect passengers when the vehicle is braking or is in a crash. Use the pictures below to explain what is meant by: kerb, kerbside, road, roadside, passenger side, driver side, front door, rear door. Explain why the rear kerbside door is called the ‘safety door’. Set out chairs in the classroom to represent the seating arrangement in a car. Role-play entering and exiting via the ‘safety door’. Have the class draw a car showing members of their family using or wearing appropriate restraints and indicating the position of the ‘safety door’. Add this artwork to a class road safety display. Why do passengers need to wear seat belts? Why are there different types of restraints for different sized passengers? These include: baby capsule, child car seat, booster seat, child harness, lap/sash seat belt. Children from birth to 4 years must travel in either a rear facing or forward facing child restraint. The type will depend on their age and size. Children aged 4 years to under 7 years must travel in either a forward-facing child restraint with an inbuilt harness, or a booster seat. Children aged 7 years to under 16 years must travel in either a booster seat or a seat belt. People 16 years and over must travel in an adult seat belt. Children aged 4 years old to under 7 years old can only sit in the front seat if all of the back seats are taken by other passengers under 7 years old. The child must travel in a booster seat without a top tether strap, because there will be no anchorage points for the front seat. Children aged 7 years and over can travel in the front seat. However, research shows that children under 12 years are much safer travelling in the back seat. The ‘safety door’ is the rear kerbside door. It is located away from traffic when a car is parallel parked on the side of the road.